The last silent film out of Hollywood, Henre de la Falaise's Legong was filmed in Bali with an all-native cast. Its simple love story is told in beautiful two-strip Technicolor, shot by the legendary cinematographer William H. Greene. Legong was restored by the UCLA Film Archive in 1994. The score, commissioned by Gamelan Sekar Jaya, was written by Richard Marriott & I Made Subandi and premiered May 7, 1999 at the Castro Theater. The score calls for string quartet, trumpet, clarinet and a variety of Balinese gamelan emsembles.The film was performed at the World Financial Center in 2000 and 2005. The movie was released on DVD (with this score) by Milestone in 2004. The DVD was recognized as one of 20 "notable" DVD of 2004 (David Kehr, New York Times). The video clip below is recorded live from the initial Castro Theater shows, which had a special magic. Listen to the audience gasp at the climax of the bridge scene. Hear the mighty gong fill the massive Castro Theater. 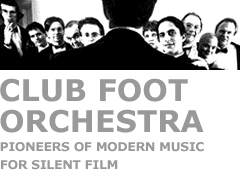 "The Milestone disc includes both the original score and a new soundtrack composed by Richard Marriott and I Made Subandi and performed by the Gamelan group Sekar Jaya and the Club Foot Orchestra. The latter could stand alone as a ravishing orchestral suite of Balinese themes."